Many parents ask us when the right time is to bring in their child for a first visit. The truth is, the answers varies depending on the situation, but we usually see children around the age of two when all of their baby teeth have emerged into the mouth. If your child ever complains of pain, you see any discolouration of their teeth or a pimple-like bump appears on their gums, we would advise you to call us and bring your child in for an examination immediately. Sometimes, parents bring in their children between the ages of 6-12 months just for us to have a quick “look see.” We take this opportunity to discuss home care and prevention. We encourage you to bring your child in with any older siblings so that our office will be a familiar place for them. Primary or “Baby teeth” are very important for a child’s function and proper development, so they should be given the same attention as you would give to the permanent, adult teeth. We, as dentists, are trained to spot problems which can be detrimental to a child’s health, but preventable if identified and treated early. Let’s go through what to expect at your child’s first visit. Provided there are no major problems, this first appointment is basically an orientation to the office and screening for your child. It is very important to familiarize your child with the office and what to expect so that his or her first experience is a positive one and that they don’t associate the dentist with pain, needles or drilling. If you wait until your child is in pain before you bring them to the dentist, they will associate the two and become apprehensive coming in for a visit – even just for regular check-ups. It is also important to instil at an early age the idea and routine of proper oral care. When you and your child arrive, you will meet our friendly staff and your child can explore the playroom. 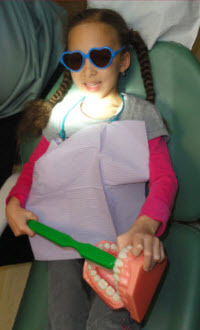 When they are ready to come into the treatment room, we will outfit your child with some cool sun glasses (to shield them from the overhead lights) and then give them a “ride” in the dental chair. Our friendly hygienist will then count the number of teeth they have while checking them for any problems. Afterwards, we will polish them, and depending on the child’s age and cavity-risk, we may recommend a fluoride rinse or “paint on” fluoride application and radiographs – more commonly referred to as x-rays. The dentist will then come in to meet your child, have a fun and interactive exam with them and answer any questions you have pertaining to home care, nutrition and how to best reduce your child’s chances of decay. After a great visit, they will get to choose a toy from our “treasure chest” and receive a dental kit comprised of a toothbrush, toothpaste, floss and dental story booklet. Of course, everything we do is dependant on your child’s comfort level and how they are acclimatizing themselves to our dental office. Sometimes, a child may not cooperate and this is okay too! We never force a child. Our goal is to make sure they leave with a positive experience and a toy to help build trust for the next time you bring them in. We can help you establish a proper home dental care routine that we strongly encourage you to be active in. Again, we want this first visit to be a positive experience for your child to help pave the way for a healthy relationship with our dental team and office and a healthy smile that comes with it.